Small houses keep a family close. My childhood home, built in 1950, is small and cozy. The kitchen has a dining room table that has a view of “out back”. “Out back” is not small. There are five acres in which we raised cattle and hundreds of acres beyond which cattle once roamed. 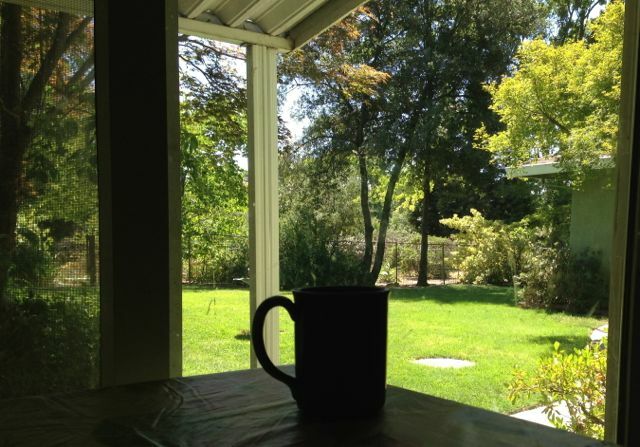 I have fond memories of mornings eating breakfast, looking out and smelling coffee. Perhaps this is why coffee is my favorite beverage. Furfuryl mercaptan FEMA 2493 (otherwise known as coffee mercaptan) is the characterizing component of coffee. Coffee flavor and furfuryl mercaptan are products of the roasting process. This chemical reaction is the Maillard reaction. The Maillard reaction is one of the most important reactions in food flavor development. The Maillard reaction is between a carbonyl group (sugar) and an amino compound (protein). Degradation of the condensation products of this reaction give a number of oxygenated compounds; such as furans, pyrazines, pyrroles, oxazoles, thiophenes, thiazoles and other heterocyclic compounds. Furfuryl mercaptan is found in other roasted foods: beef, pork, chicken and popcorn. It is a sulfur compound and is very powerful. An empty bottle of this mercaptan broke at a facility I worked for and management evacuated the facility overnight. Furfuryl mercaptan is “that” strong and is found in coffee at levels of 1 ppm. Furfuryl mercaptan can be described as roasty, but when used at a high or unbalanced level, it is “skunky”. Skunky is undesirable in coffee flavors. In my experience, coffee flavor has never compared to fresh brewed. Flavor is reminiscent, but it can not conjure up fond memories of the dining room table looking “out back”. Mother nature wins with coffee. Harold McGee writes in *On Food and Cooking* that over 800 aroma compounds have been identified in the roast coffee bean! I’ve actually been working on a procedure for some time now to produce a consistent hydrolyzed wheat gluten(actually quite difficult without any HCl) If combine this with invert sugar I(sometimes) get a wonderful roasted, nutty crumble which is a great addition to season anything savory. Are there any specific intermediates that you can supplement something with to favor a specific endproduct? Do different ratios of amino acid/sugar(each amino acid and sugar I mean) lead to different results? I suppose I should just find some isolated amino acids and some glucose at the health store and figure out myself. Hi JJ: Your work with hydrolyzing wheat gluten sounds very interesting. I’ve only know of hydrolyzed products being a result of using HCL. I do remember using “roasted” type HVPs in formulation and loved the unique flavor notes. Glad to see you have the comments working. Always a pleasure to read your posts. I am officially working my way up the flavor training ladder and could not be having more fun! JJ, This link to amazon below is a great book source which discusses flavors far beyond Harold McGee. “On food and cooking” is a great general source but “Flavor Chemistry and Technology” covers Maillard Reactions far beyond. Graphed profiles are contained in this text illustrating which compounds are most prevalent within the particular conditions Susie stated in her reply. Your best sources will always be peer reviewed journals discussing specific research material on the subject.